Dover Street station platform - looking South along the Mainline at the Cathedral in the early 1980s. Historic American Engineering Record. 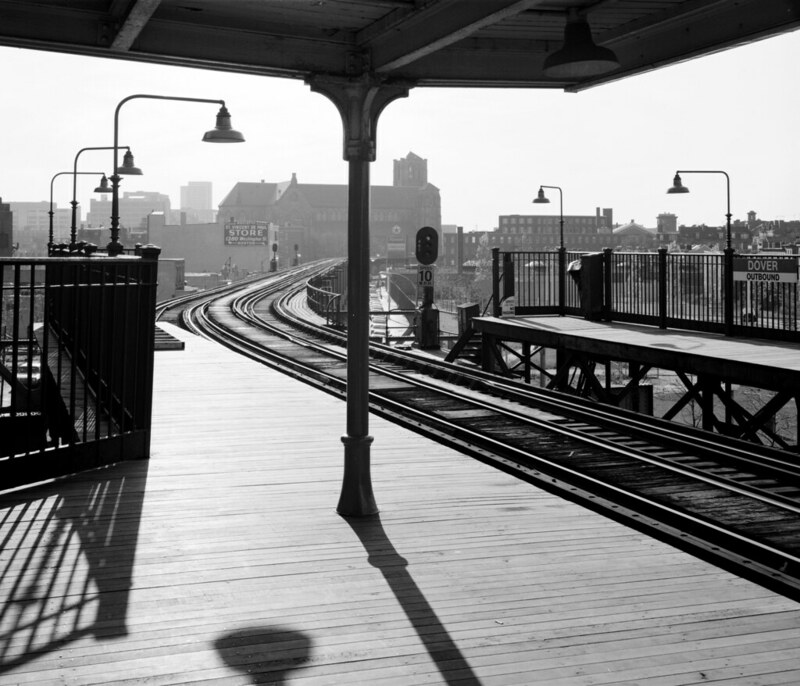 From 1903 to 1987 rapid transit service was provided to the Boston neighborhoods of the South End, Roxbury and Jamaica Plain by an elevated railway above Washington Street. Emerging from the subway downtown, the train passed through five stations before its final stop at Forest Hills Station: Dover Street, Northampton Street, Dudley Square, Egleston Square and Green Street. The stations and elevated structure which dominated the environment of Washington St for 84 years was replaced in 1987 by the current Orange Line along the Southwest Corridor. The structure and stations were subsequently demolished. Unparalleled photographic survey of the Washington Street Elevated a few years before it was demolished. History and photos of the current and previous Orange Line routes. Photo tour of the Washington Street Elevated line in 1987. Overview of the Washington Street Elevated. Overview of the original railroad embankment that was depressed to create the current route of the Orange Line. Overview of the original station. Photo of the station in 1971. Photo of the Elevated Orange Line Station. 3.5 minute news report on the last day of the Washington Street Elevated route.